Moringa ( Malunggay ) is is not your ordinary green leafy vegetables. 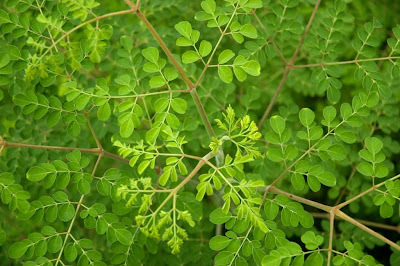 Called “Malunggay” in the Philippines, “Sajina” in the Indian Subcontinent, and “Moringa” in English, is a popular tree. Malunggay, known scientifically as Moringa oleifera Lamk, is one of the world's most useful plants. It is used as food, effective flocculant or water treatment, antibiotic, source of oil, and coagulant for turbid waters. It is also called mother's best friend, and miracle vegetable by many who know malunggay's beneficial uses. It is cultivated in all countries of the tropics. It is easy to plant and is available year-round. 53 mg ascorbic acid or vitamin C.
The antioxidant activity of malunggay is about 71%, with µ-tocopherol (vitamin E) equivalent of 45. Malunggay (Moringa) is usually cooked with chicken as tinola, or with fish and other vegetables, mongo soup dishes, and blanched as salads. For daily herbal medicinal use, just prepare malunggay tea which is about 1 cup leaves boiled in 1 and 1/2 glass of water. Drink this daily. You can improve the taste by adding lemon grass (tanglad) or pandan leaves. A single preparation can be stored up to 2 days in a thermos bottle, however, a fresh preparation is always recommended. Oh I love Malunggay. It is my favorite green leaves. By the way, is it ok to add your link in my page? HOpe you'll add mine too. Have you tried the leaf powder or capsules? Do you know that the dried leaves are more nutritious than the fresh ones except in Vit. C? Please visit our website at www.EnjoyMoringa.com and let the others know too. it is a matter of available calcium. moringa has more available soluble calcium than limestone and a great many other rocks. Is malunggay nutritional supplement is good for hair loss? Hi, I found a few tips to get rid of various skin problems like acne, eczema, rosacea...Please do have a look on it! I have also the skin problem and my friend suggested me moringa oil. I want to buy moringa online, please suggest me link that provide the best service.